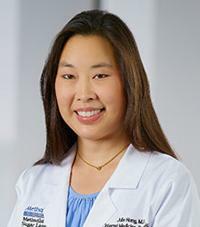 Dr. Julie Hung's goal as both an internist and a pediatrician is to develop a long-term relationship with her patients so she can work with them to optimize their health. Dr. Hung's special interests include annual physicals, newborn and well child exams, sports physicals, pre-operative exams, women's health, hypertension management and thyroid disorders. Dr. Hung is board-certified as an internist by the American Board of Internal Medicine and a pediatrician by the American Board of Pediatrics.